Federal Bureau of Investigation (FBI) Director Christopher Wray testifies before a Senate Intelligence Committee hearing on Capitol Hill in Washington, Feb. 13, 2018. FBI chief Christopher Wray told lawmakers Tuesday that investigators mostly completed their background security checks on a former aide to President Donald Trump months ago, long before the White House says it first learned about allegations that staff secretary Rob Porter had emotionally and physically abused two former wives. Wray laid out a timeline for information the Federal Bureau of Investigation turned over to the White House that called into question the Trump administration’s claim that it first learned about the serious accusations against Porter last week, which led to his resignation within two days. Porter’s two former wives, Colbie Holderness and Jennifer Willoughby, have said they told FBI investigators details of their troubled marriages to the 40-year-old Porter in January 2017. Holderness provided a photo alleging that she sustained a black eye when Porter punched her in the face while they were on a vacation to Italy in 2005 and Willoughby offered proof that she obtained a restraining order against Porter in 2010. Wray declined to discuss the content of the FBI’s reports on Porter to the White House, but he told the Senate Intelligence Committee that the FBI “submitted a partial report on the investigation” to the White House in March last year, and then a completed background check in late July. He said the White House asked for “follow up inquiry” and that the FBI provided that information in November. Wray said the FBI administratively closed its investigation file in January, but “received some additional information” it passed on to the White House earlier this month. “I am quite confident that in this particular instance the FBI followed the established protocols,” Wray said. FILE - White House Staff Secretary Rob Porter, left, reminds U.S. President Donald Trump he had a bill to sign after he departed quickly following remarks at his golf estate in Bedminster, New Jersey, Aug.12, 2017. The White House has struggled to offer a coherent timeline of which officials knew what about Porter’s background and when, all the while as he continued to work in close proximity to Trump while holding an interim security badge, not the permanent security clearance he was seeking. Trump press secretary Sarah Huckabee Sanders told reporters Tuesday that the White House personnel security office was considering the FBI reports on Porter throughout last year. But she said the security officials had yet to finish their consideration of the Porter clearance application and had made no recommendation to higher-level officials about Porter's security status at the time he resigned. She reiterated the White House contention that chief of staff John Kelly, Porter’s immediate boss, did not know about the spousal abuse allegations until they were first detailed last week in a story by the Daily Mail, a British tabloid. After the story was published, Kelly and Sanders both released effusive statements about Porter’s White House performance, where he helped oversee which documents and briefing papers were sent to Trump for his review. But Porter’s tenure at the White House unraveled quickly after publication a day later of a picture of Holderness with her black eye. The White House has said that Porter’s enhanced security clearance was left up to the FBI. But officials at the top U.S. law enforcement agency say that to the contrary its investigators collect background information about high-level appointees like Porter and hand it over to federal agencies, including the White House, for their decisions whether to approve clearances for their officials to view classified information. 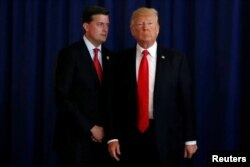 Trump has drawn wide criticism for praising Porter’s work at the White House and wishing the Oxford- and Harvard-educated official well in his professional life in the years ahead, while never publicly saying anything about the two women who accused Porter of abusing them or about domestic violence in general. Sanders told reporters Monday that the White House and Trump “take domestic violence very seriously” and that the president “above all ... supports victims of domestic violence." Holderness described her marriage to Porter in an article in The Washington Post.